Location: Supe Valley, Peru. Grid Reference: 10o 53' 39.55" S 77o 31' 20.05" W.
The Caral-Supe valley was inhabited between roughly 2,600 B.C and 2,000 B.C (1). 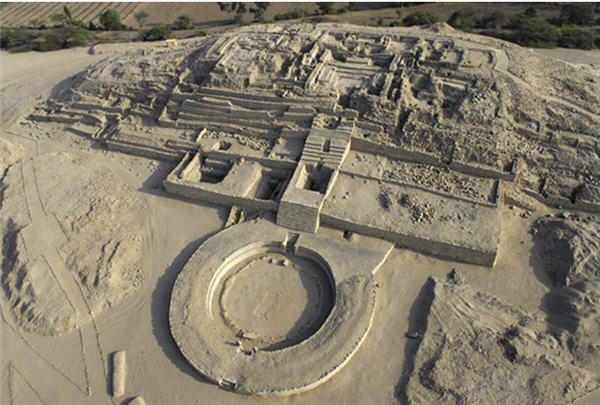 Caral was described by its excavators as the oldest urban centre in the Americas, a claim that has since been challenged by the discovery of even earlier ancient sites nearby. 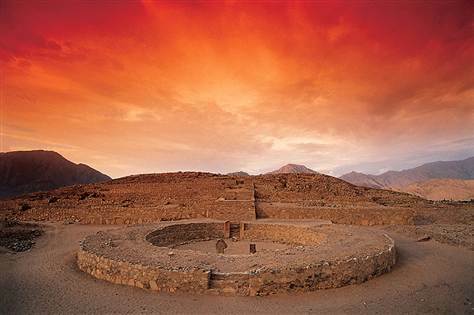 Caral made headlines in 2001 when researchers carbon-dated material from the city back to 2,627 B.C. (3) the very time that the Egyptians were building their first pyramid complexes. The layout of the city shows signs of it being planned with districts set aside for different trades, for the wealthy and the poor. The 163-acre city was the administrative centre for a complex civilization. 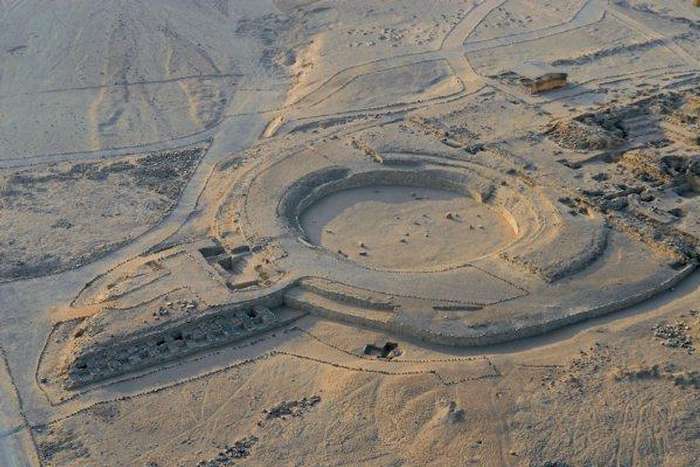 The site of Caral and the cluster of 18 similarly dated sites located in the Supe Valley form what is now called the Caral-Supe Civilization. They are important because together they represent the earliest known urban settlements in the Americas, predating the Olmecs by a solid thousand years. The Caral-Supe Civilisation is the earliest known in the Americas. The centre of the Caral complex consists of a central public area with six large platform mounds arranged around a huge plaza. The largest of the mounds is 60 feet high and measures 450 x 500 feet at the base. All of these mounds were built within one or two building periods, which suggests a high level of planning, generally associated with state level societies. The public architecture has stairs, rooms, and courtyards; and three sunken plazas suggest society-wide religion. 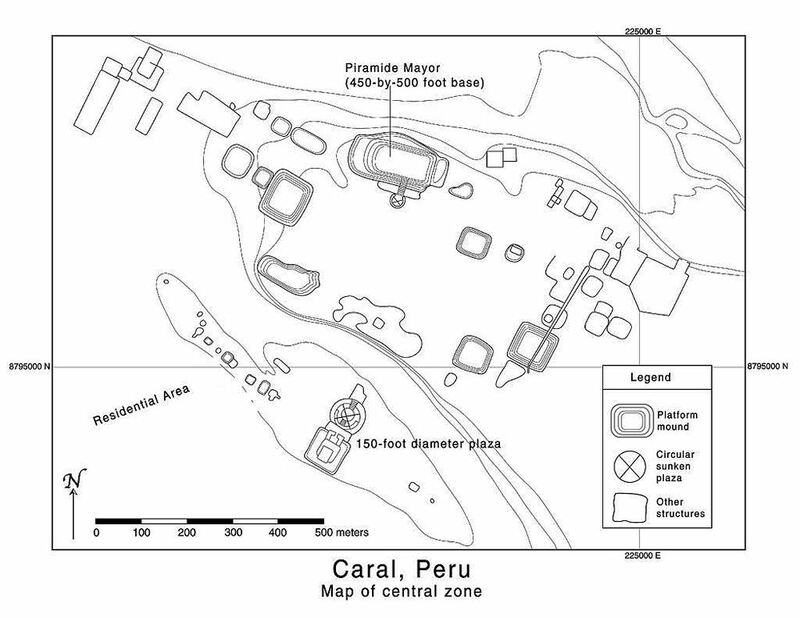 Of the 18 other sites near Caral, ten are more than 60 acres in size; all of them have similar public architecture. Crops included squash, beans, and cotton, grown in the dry desert climate with the assistance of a intricate irrigation system. To erect their structures, they perfected the "shicra-bag" technique, by which armies of workers would gather a long, durable grass known as shicra in the highlands above the city, tie the grass strands into loosely meshed bags, fill the bags with boulders, and then pack the trenches behind each successive retaining wall of the step pyramids with the stone-filled bags. With bags acting as landfill, anchoring and reinforcing the structure at each stage, the people of Caral were able to build pyramids up to 70 feet tall. It was the grasses that made these bags which allowed archaeologists to so accurately radio-carbon date the complex. The Inca were known to have used a complicated system of knotted cords of different colours called Quipus. Many of these quipus (also spelled khipus) were destroyed by the Spanish conquistadors in the 16th century, but approximately 200 of them dating no earlier than about 650 AD have been found. 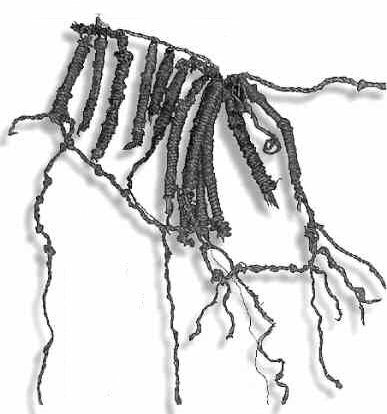 The recovery of quipu from the civilization of Caral, if the context and dates are correct, suggests several things. First, this is additional evidence that Caral was a likely precursor to the Inca civilization (since the Incas also used quipu). Secondly, quipu as a tradition dates at least 2000 years older than we recognized prior to this point. Thirdly, and most importantly, if quipu were indeed a form of written communication, they are among the earliest forms of writing in the world, only slightly younger than cuneiform, which has been identified at the Mesopotamian site of Uruk approximately 3000 years BC. The quipu with its well-preserved, brown cotton strings wound around thin sticks, was found with a series of offerings including mysterious fibre balls of different sizes wrapped in "nets" and pristine reed baskets. "We are sure it corresponds to the period of Caral because it was found in a public building," Shady said. "It was an offering placed on a stairway when they decided to bury this and put down a floor to build another structure on top." Evidence of drug use and possibly aphrodisiacs was found at Caral. One theory suggests that the coca they found may be evidence that Caral sprung up as an organized coca growing and distribution centre. 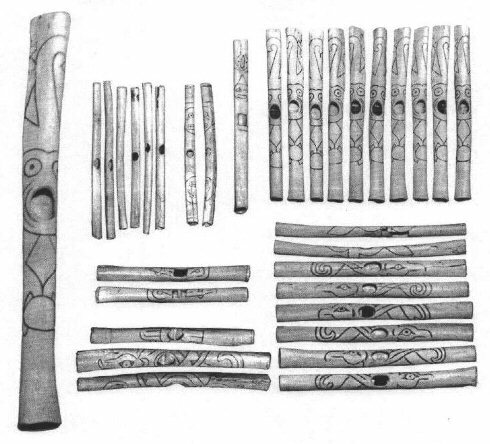 The Flutes were found between the pyramids within the large sunken amphitheatre, with enough room for hundreds of people during community gatherings. The 32 flutes made of the wing bones of pelicans were tucked into a recess in the main temple. They were played by blowing into the central hole and covering either the left or right hand holes. And, in April 2002, they uncovered 37 cornets of deer and llama bones. "Clearly, music played an important role in their society,". Based on the radiocarbon dating from [Solis 2001], the most likely date for the flutes appears to be 2170±90 BCE (Sample “Beta 134427 - Offering inside room on top of Piramide Mayor, Caral”). 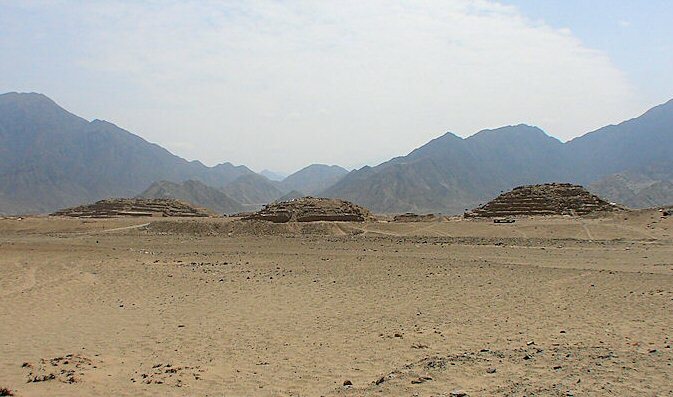 The 'Greater Pyramid', is a strikingly large building located in a dominating position within the urban plan of Caral. It is said that officials standing on the highest part of this pyramid could monitor not only the activities going on the city, but also a large part of the capital area in the middle valley. At the site was found the corpse of a young man who was probably sacrificed in honour to local gods. Archaeologist also discovered walls decorated with small figures and collars made of shark teeth. A 29-foot wide staircase opens into a series of small rooms, which include an atrium and a sacred altar. The altar room has a small hole in the floor, in which offerings were once burned. Huanca means “standing stone”, and this impressive monolith stands 2.15 meters in height directly due north of the Huanca pyramid. It is therefore considered to be related to the astronomical and ceremonial aspects of life in Caral. Likewise, it is found across from the main staircase of the important Pyramid of the Huanca. Archaeologists believe that this monolith was used for astronomical and ceremonial purposes.